So, I’m going to level with you. I’ve always been frankly a little bit cross with Marilyn singing about diamonds. You know, how men will grow cold as we grow old, how a kiss is grand, but won’t pay the rent(al) and how square-cut or pear-shaped, these rocks don’t lose their shape, implying that we do (writes she as she looks down at the start of her winter hibernation tummy… Ms Monroe may have had a point with that one). So Marilyn, diamonds are a girl’s best friend are they? That’s not awfully modern of you. In fact, it’s sort of archaic. Sure that song was of its time, but they’re still going on about it now. I am a strong empowered woman. I earn my own money. If I want a diamond, I’m not going to wait for a man to buy one, I’ll take myself off to a jeweller and choose one just for me. But then I believe in being a bit decadent like that. And yet, sitting here writing this, I’m drawn to look down to my left hand, as my fingers glide around the keys (sounds more glam than the clunking which this ancient keyboard is capable of), and I see it sitting there, on my wedding finger: my first diamond. And below it I see the only other diamonds in my life in their art deco style band (a surprise after my daughter was born), and I can’t help but smile. Because as much as I am all for equality, and, when it comes to shoes, a little bit decadent* I’m all talk when it comes to the thought of buying myself a diamond. All talk. *they made me do it. But why do these little bits of carbon have the ability to make the wearer smile so much? It’s not because they might pay the rent. Or that they haven’t aged (though, unlike my hands, they haven’t) It’s because they were given to me with love. From love. And – if properly looked after and regularly cleaned (I’ve never quite mastered that) – they will always sparkle. Always. And isn’t that why they’ve become the stone de riguer for an engagement ring since De Beers came up with the tag line that A Diamond Is Forever back in 1947? I mean, if you’re going for an engagement ring, there’s got to be a diamond on there somewhere I’m afraid. It’s the law. And so to buying an engagement ring. It’s simple right? You just go with what you know that she’ll love. Easy. Buying for us ladies is a total doddle. We are in no way whatsoever fickle, we say what we want. We don’t change our minds, and we certainly, certainly are always happy with what you get us? You dispute these facts? Women are hard to buy for? Fickle you say? You have to read between the lines to try and work out what we want? We change our minds?!?! 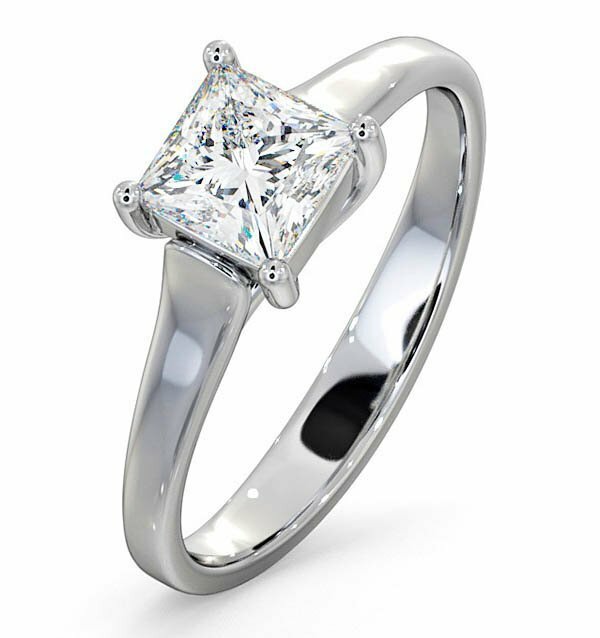 Here at Love Scarlett though we want you to rest assured, if you go diamond, you can’t go wrong. And we’ve teamed up with The Diamond Store to take you through your guide on how to buy, and how to make sure that the only sparkle you see aside from the ring, as her teeth as the grin spreads so wide when she sees what you’ve chosen. Everyone is different. That’s what makes the world such a truly awesome place. And no one knows your fiancé or fiancé-to-be better than you. (We hope). Now, Mr Love Scarlett (my husband of nearly twelve years now) knows me well. And he knew well enough not to buy me a ring. We’ll skim over the facts that he also didn’t quite know he was going to propose to me until he did (over the phone, read it and weep, that’s one to tell the grandkids one day). He knew me well. I’d always (thought) I’d fancy something very angular. Your classic Emerald cut I thought. The thing is, the right cut is one that you can only glean by trying them on. And guess what? It’s highly unlikely that we’ve been into a jeweller and tried on all the different shapes. We can only hazard a guess at the shape we might want. And when it came to trying on, much as the Emerald cut got me a bigger stone, and looked, well nice, it didn’t sparkle like I wanted it to. And it wasn’t until a tried on a round cut diamond that the smile began. I had found my cut. The most important thing is to have subtly asked questions answered about style and look of the ring. Maybe by stopping at shop windows in the months leading up to the proposal, or by paying careful attention to comments she makes about her friends’ engagement rings. The main thing is to try and understand what kind of ring she would like. Whether it’s a gemstone or a diamond, that’s also quite an interesting factor. You could also ask her parents or best friends for advice. After that of course the most important thing is to fix the budget. The one thing I must add to this is that of all the jewellery we sell, the ones that get returned the least for a refund or for swapping are engagement rings. So that brings us to the most significant point about engagement rings: that actually it’s the sentiment and the whole emotion of getting engaged, which outweighs the ring itself in many ways. What is your advice for men shopping with their partner? Well, the beauty of the internet is that you can both look at rings together or separately on the computer, laptop, iPad or mobile. Perhaps some couples would share an online wish list or add things into a basket – or even just write them down – to come up with a shortlist of rings that peak both your fancy, and why. You might find a few of those ideas overlap, but even if they don’t in the end of the day it’s the lady who will be wearing the ring so she must be happy with it. The two important things to think about when buying an engagement ring… One, you will only buy this ring once, so at the risk of sounding like a salesman, buy the very best you can afford. Get the best metal, the best setting, the best diamonds that your money can buy. You’re only buying it once so you don’t want to regret it later on. The second bit of advice that I would give for couples shopping together is again down to budget: you also have to give her, your fiancée, some kind of budget to work to. The tradition has usually been one month’s salary. However, we’re not necessarily always seeing that – in fact, we see lots of people spending all kinds of money so we always say just buy the very best ring your can afford. The four C’s are diamond basics, yet everyone probably has their own priority. For some size matters, others want as near to perfection as they can get. How should you prioritise when it comes to Cut, Clarity, Carat and Colour? This is a great question and something many customers really struggle with. It’s so easy to pick up a magazine and see celebrity rings at a certain size or with a specific cut. But the reality is not always a one-carat, perfectly cut diamond. 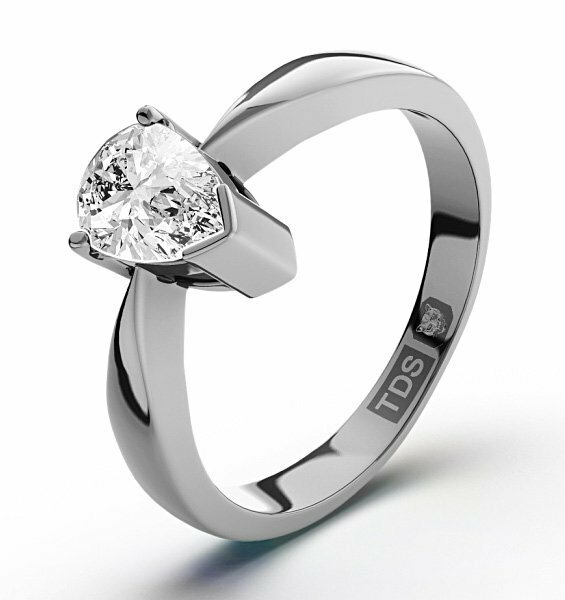 The truth is that if you go to a good jeweller like TheDiamondStore.co.uk or any good retailer on the high street, really, as long as you’re buying a diamond in an H colour or above, everything else will follow. So to make it very easy for our customers, we say “Go for colour H and above, and all the other quality factors will fall into place”. If you have a brilliant one-carat diamond at colour H or above, and clarity Si or above, you’re not going to find any obvious flaws in it. And then the second part is matching your budget to that quality. 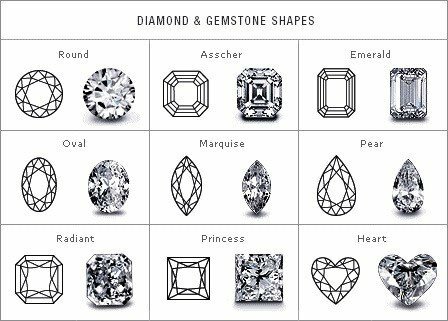 So if you don’t want to read up and study the Four Cs and other diamond technicalities, simply going for an H/Si diamond and then working to a budget will ensure you’re making a good purchase. If you’re conscious of the diamond’s size, and want to really declare your love in a big way, then the halo options we do are perfect for that. You get a solitaire diamond, but it’s also encircled by a “halo” of smaller diamonds – and this gives the ring a much bigger look. 4. What are the biggest trends in engagement jewellery at the moment? Colour is making a big comeback, but what have you noticed are the fashion trends at the moment? We’re now seeing a trend that was already happening in America a couple of years back, which is the halo design ring that I mentioned before. Before, the UK market was mainly for single set stones within a yellow or white gold band, and we’re seeing that really pushed now. People are expecting more diamonds, for instance all the way down the ring’s band, and halos, and so on. In other words, our customers are expecting something a little more showy, something more sparkly. And if you look on our site, you can see a lot of halos, side stones and even double and triple halo designs filling that desire right now. The other trend we’re seeing is that we’re moving towards vintage looks; that’s very prevailing now. The Great Gatsby era, so we’re talking about the Art Deco lines of the Roaring Twenties, these are very popular for diamonds. But also the contemporary takes on Edwardian and even Victorian jewellery, with intricate diamond designs and settings, and as you mentioned, coloured gemstones. These have a really substantial look and a romantic feel – quite breath taking. White gold and platinum are still very much in, but also we’re also seeing yellow gold rising in popularity now, especially along with the vintage gemstone looks. Will diamonds ever go out of fashion? That’s actually a very interesting question. We sell quite a lot of gemstone jewellery, but even that’s usually accented with diamonds. 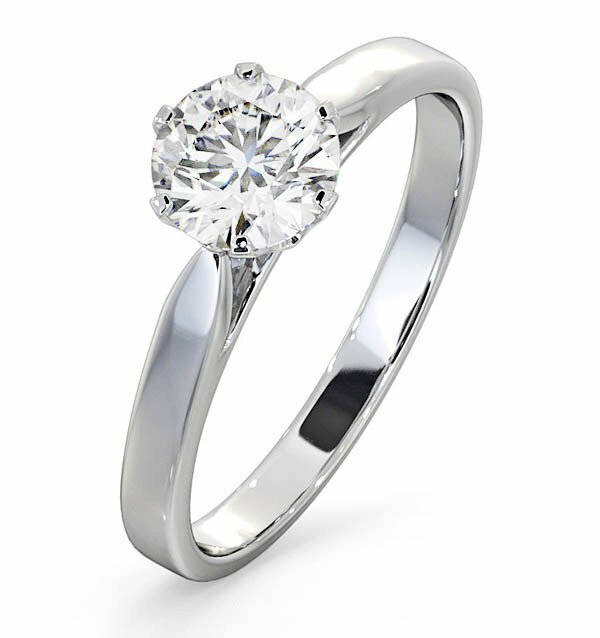 The solitaire diamond ring may slightly go out of fashion, and we might end up with halo rings. Or we may see more of the very popular Duchess of Cambridge/Princess Diana ring, the classic big blue sapphire, as it has been very fashionable ring for a few years now – but that ring also still includes diamonds. Ultimately, if you ask most people to imagine an engagement ring, they’ll almost automatically think of a diamond. So I can’t really see that going out of fashion soon. They are, after all, the rarest and most beautiful stones known to mankind. What advice do you have for making a budget go further and getting the best deal? I’m slightly biased here because we’re an online jeweller. But there are significant savings to be made when buying through an online jeweller such as us, because we’re cutting out the necessity to have a string of expensive shops to maintain. We’re also at an age when we’re lucky enough to be able to shop around. When I think about my twenties, when the internet didn’t exist, we had to go down to the local high street. We were given the choice of what was on offer there and then. Back then, people would travel to Hatton Garden or the Birmingham jewellery quarter, because they could get a much broader selection of jewellery ideas and prices there. Today’s engagement ring buyers have the world at their feet because they can browse for hours and hours on end, from the comfort of their own home, on their iPad or mobile, and they can just seek for the best option to make their budget go as far as possible. All you need then, to get the best possible price for your money, is that balance of size and the quality we talked about before. So at the end of the day, getting the best deal is about having knowledge, and knowledge is at the fingertips of everyone right now, when so many online jewellers go to such great lengths to inform customers, and offer them a huge range of styles and prices. By far, it’s from start of November all the way through to Christmas. We sometimes still get orders on the 23rd December for next day delivery! Then we start our sale, and that propels us all the way through to the middle of January. And then everybody’s minds turn to Valentine’s Day. However, there are other times of the year, which are equally busy. June, July and August are busy months for us because many people need jewellery for their weddings. But more than that, in the years that come after engagements and weddings, people use jewellery to celebrate anniversaries from the 5th and the 10th anniversary all the way up to the golden and gemstone ones. So during the summer months we’re kept very, very busy with items like eternity rings, bracelets, necklaces, and special keepsakes for anniversaries. For the rest of the months, March, April, May and September-October, again there are a few anniversary gifts then, but there are also birthdays every month. So really, we’re busy all through the year, although undoubtedly as you say, Christmas is the big one for us! Thanks so much for taking the time to chat to us Gary, and make sure you tag us over on Instagram if you get a sparkly surprise over Christmas!